- For centuries they have wandered across the vast expanse of the Arabian desert on camel back, braving dry, hot winds. Now the Bedouin people - from the Arab word 'baddwin', meaning dweller of the desert - are a fast diminishing tribe, with many giving up their nomadic lifestyle and settling in the cities. But old traditions, like the famed Bedouin hospitality and ceremonial folk dances, have become an important part of modern Arab culture. Another well-known custom is the Bedouin wedding, an event that is a riot of color and music, which reflects the true spirit of the desert nomad as well as the ancient Arab concept of marriage - the union of two families and not just two individuals. A traditional Bedouin wedding lasts for a week and begins with the 'Al Khoutha' (proposal), where the groom's father, accompanied by close relatives and friends, visits the bride's father to seek his daughter's hand for his son. The ceremony revolves around the traditional mint-flavored Arab tea. Very sweet and strong, the tea has an aroma that matches the 'gahwa' (Arabic coffee). This is followed by the 'Al Akhd', which involves negotiations between the two families and mutual agreement of a marriage contract. The negotiations between the two families are relayed through a public address system. The wedding preparations get underway with the colorful 'Laylat Al Henna' where friends of the bride decorate her hands and feet with henna. This is followed by the fun-filled 'Al Aadaa', where the bride's friends tease the groom to pay a fee for decorating his bride. 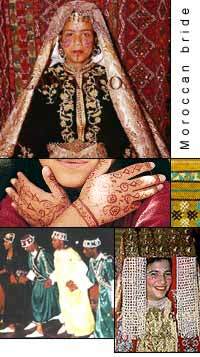 ''The Laylat Al Henna ceremony is the Bedouin version of a bridal shower and to the Sudanese, it is more than mere skin paint. It symbolizes beauty, luck and health,'' says Adam Drasoa, member of Sudan's National Assembly and Chairman of the Pastoral Union of Sudan. He was among those present at the recent enactment of Bedouin wedding rituals at the Dubai Shopping Festival. The Bedouin wedding ceremonies were put on show by the Dubai Tourism and Commerce Marketing organization. ''Authentic events such as these help us recreate the magic of the region. We have deep respect for our past and we aim to preserve and promote it,'' says the tourism body's director Mohammed Khamis Bin Hareb. Relatives from the bridegroom's family arrive in procession at the bride's house to a warm welcome complete with songs, dance and music of the versatile, one-string rababa violin and 'dalouka' (big drums). Men perform 'Al Ardha' (war dance), armed with swords and whips. Women from the bride's family display the 'Zaahbaah' comprising the girl's clothes, gifts from the groom's family, jewellery and other items. The women and men sit separately, under black goat hair tents. Guests bring gifts or 'nuqout', which was traditionally sheep, rice or money. Now it could be a ''TV, silver or a piece of crystal or any thing else modern,'' says Hareb, himself a Bedouin. The wedding ends with the 'Tarwaah' - the bride's departure for the groom's house, perched atop a camel fitted with a 'houdach', a special and comfortable saddle. A week later, the bride pays a visit to her parents and presents them with a sheep, some rice, sugar and butter, to indicate her well-being in a house of abundant resources. ''In the past, the couple would go inside their camel hair tent and the bride would not be seen by the crowds at the wedding celebrations. For a young man to get married, he had to have a camel hair tent, which in the past was very expensive and hard to get,'' says Hareb. According to Abdullah Hamdan Bin Dalmook of the Dubai tourism body, Bedouin marriages are now shorter, but most stretch over at least two days. ''Marriage is a time for intimate bonding for families and friends. As per ancient Bedouin custom, the bride and groom do not meet until the ceremony is over. They meet only when she enters her husband's house,'' he explains. 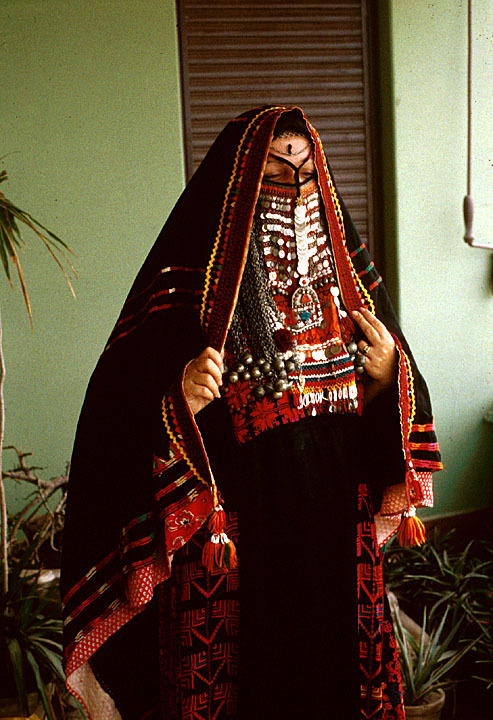 The traditional Bedouin wedding costumes are richly embellished with fine hand embroidery, worked in cross-stitch. The design is embroidered across the front and back of the dress, down the sleeves and along the main seams. Machine-stitched embroidery is now replacing the hand embroidery. Customarily, a prospective bridegroom pays the bride's father a dowry or bride price, part of which he uses to buy jewellery for his daughter. Under Muslim law, any jewellery bestowed on the bride in this nuptial settlement becomes her property and insurance in times of need.